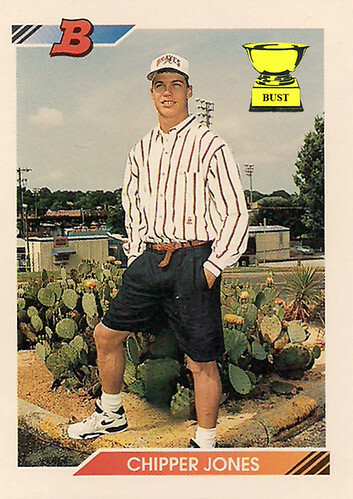 Today's fashion model: Here we see a dapper, young Chipper Jones looking even sharper than the cactus spines that are about to pierce his bare calves. Chipper is sporting a tasteful, pinstriped Cheetah brand long-sleeve button-down to go with his Canyon River Blues dress shorts. His woven leather belt may seem inappropriately shaped, but not after you realize it's only pointing to his sparkling new Nike sneakers and scrunched-down, knee-length tube socks. Chipper is looking quite chipper indeed, having folded at least a hint of an arch into the Braves ballcap the photographer handed him just minutes earlier. That prickly pear may be flowering, but it's Chipper's wardrobe that is truly in bloom.